How Does Your Skill Compare? 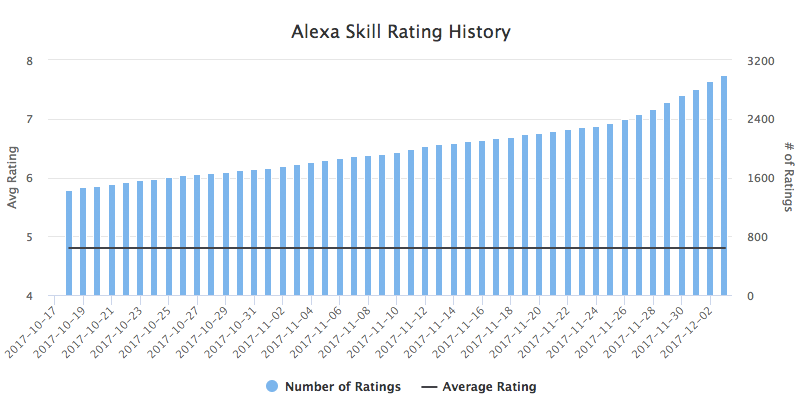 We analyzed Alexa Skill ratings over the month of November. 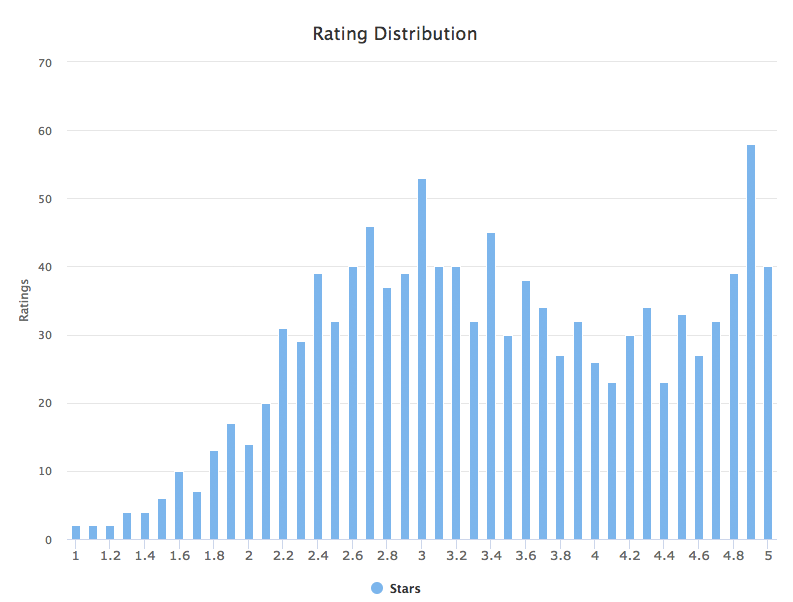 Of the nearly 24,000 Skills at the end of November, approximately 62% had no ratings at all, and 16% had only one rating. The majority of both one star and five star ratings are the result of only one review. 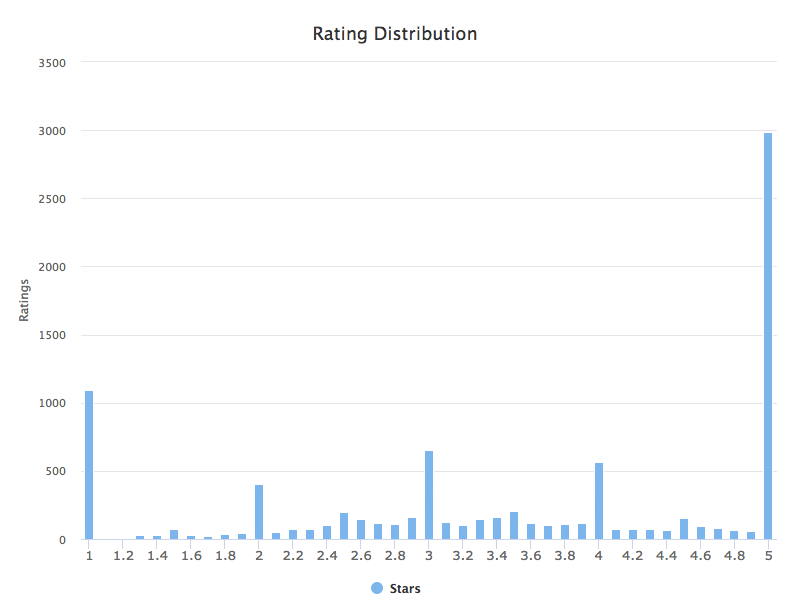 In fact, 70.5% of one star reviews are from a single rating, and 65.6% of five star reviews are from one rating. The top categories of Skills are Games, News, Education, and Music. 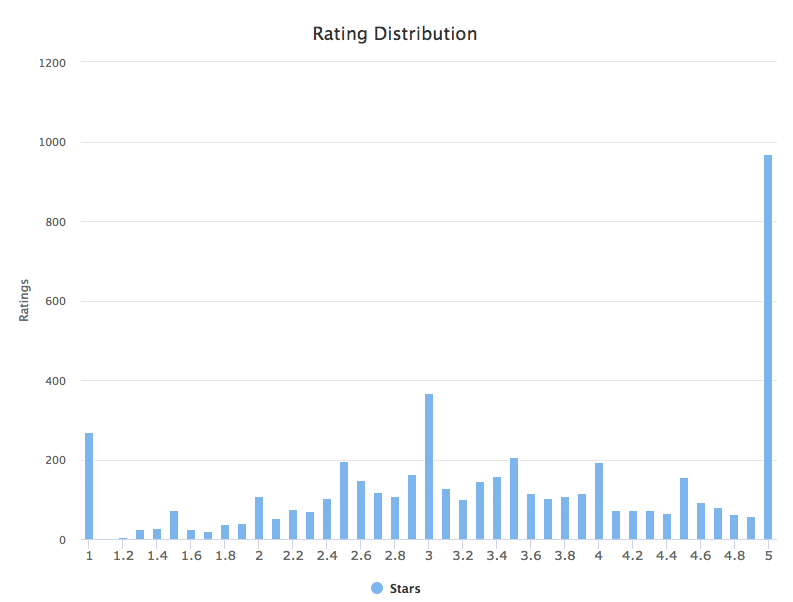 Of the more than 5,600 Game Skills, only 35% have ratings. Of the approximate 3,400 News Skills, only 25% have ratings, whereas about 35% of the nearly 1,200 Education Skills and 31% of the approximate 740 Music Skills have ratings. Conversely, more than half of the Skills in categories like Novelty and Humor, Lifestyle, and Smart Home, have ratings. In fact, 59% of Smart Home Skills have ratings, averaging about 3.4 stars. Categories with a high percentage of ratings are Home Services (75%), Connected Car (68%), and Utilities (68%), but the number of Skills tends to be much lower as well. For example, three of the four Home Service Skills have ratings. Earlier we surveyed users of Alexa and Google Home and found Music was the top use case. 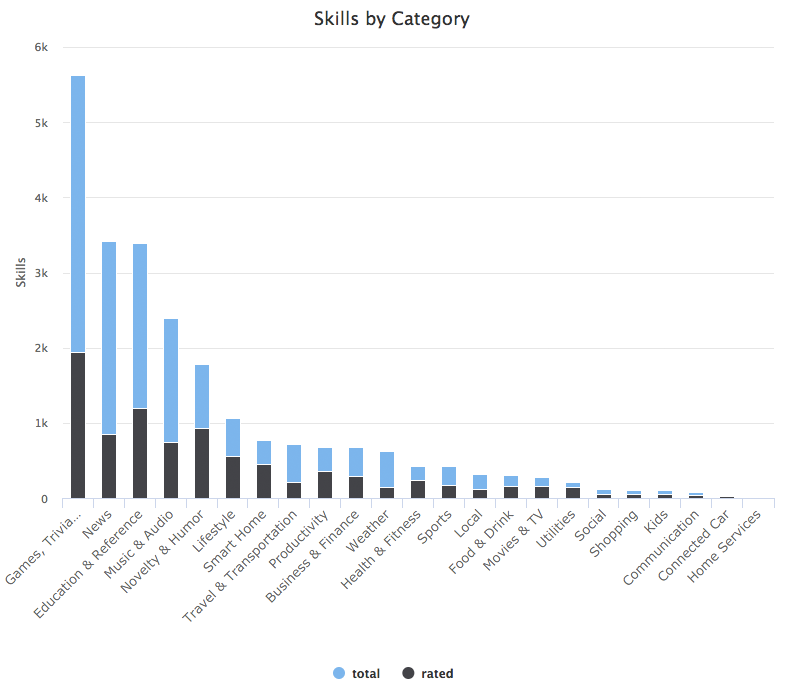 Interestingly enough, Music is the fourth most popular category of Skills in terms of the number of skills, and the category has a 4.2 star rating on average. 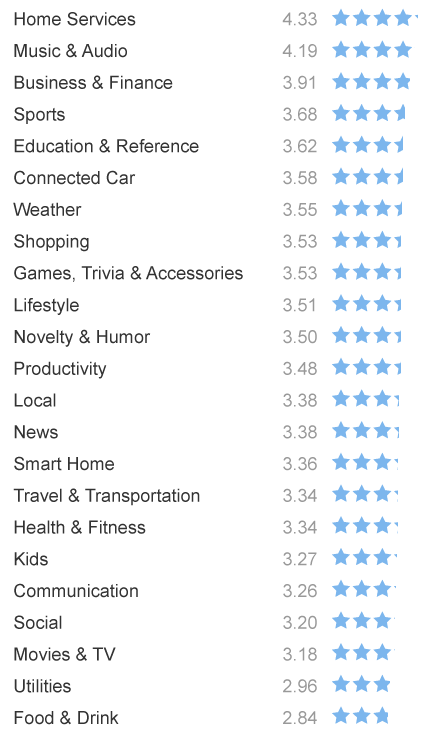 Food and Drink and Utilities tend to have the lowest average ratings, with 2.8 and 2.9 stars respectively. The most frequently rated Skills for the month of November are below. Many of them are also top rated between 4.7 and 4.9 stars, but interestingly enough, there are some that aren’t very highly rated like the TP Link and Sirius XM Skills. 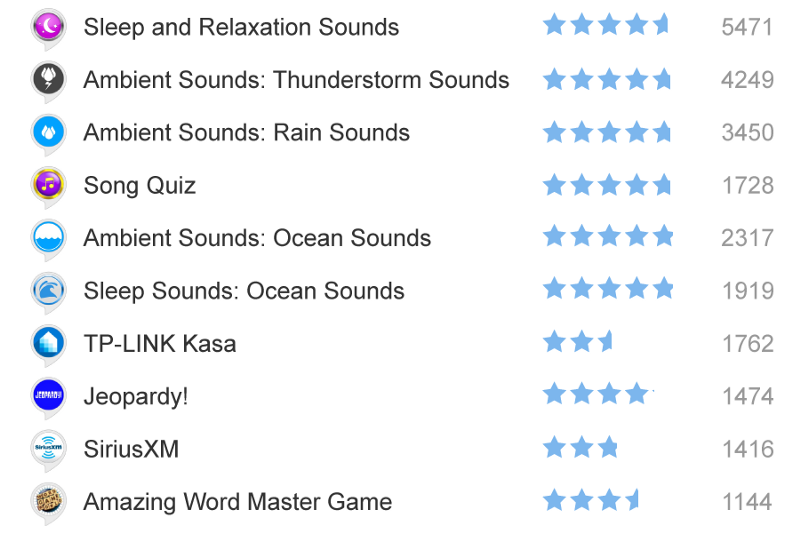 What’s also interesting is, of the most rated skills, six of them are in the Music and Audio Category. 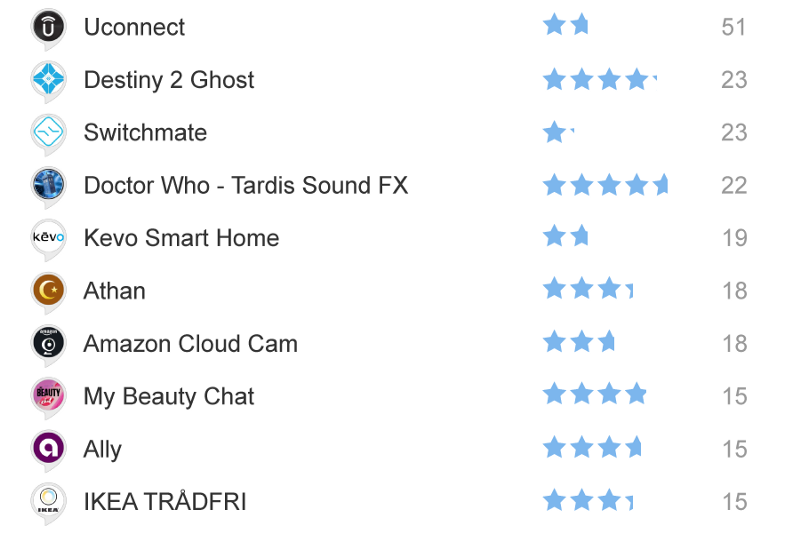 Rounding out the top ten are three Games, and only one Smart Home skill. At Dashbot, in addition to voice analytics, we provide competitive intelligence and comparison metrics. We’re excited to announce our new Alexa Competitive Intelligence tool. With our tools, developers and brands, can see how their Alexa Skill compares to others. Our Market Metrics reports show comparisons based on interactions and users, and our Competitive Intelligence reports show comparisons based on Alexa Star ratings. We support Alexa, Google Home, Facebook Messenger, Slack, Twitter, Kik and any other conversational interface.